There can be no doubt that America is going through a period of transition unequaled in our history since the Revolution of 1775 -1781. The American people voted for change and the Obama administration is delivering it — in spades. The question is; what will the nation be like after the change? There are two possible outcomes depending on the permanence of the transformation taking place. There are already signs of another change on the horizon that has the potential of counteracting those being made. No one can predict the future with any degree of accuracy. However, we can look at the trends and see where they are likely to go. The character of America in the twenty-first century will be determined by the outcome of events taking place during the present generation from 2000 to 2020. One way of describing what the country is likely to look like in 2020 is by comparing it with other governments. It is evident that President Obama and his supporters intend to take the country in the direction of socialism, or as Mark Levin more aptly describes it in his best selling book, “Liberty and Tyranny”, “statism”. In looking for a model for a twenty-first century, socialist America it is only natural that socialist countries like the Soviet Union, Cuba, China and perhaps even the National Socialist government of Adolph come to mind. However, it is so politically incorrect to compare any American, no matter his political philosophy, to Hitler that to do so immediately causes readers to discount the argument. Therefore, let us put aside Nazi Germany as a possible model. The socialist takeover of Russia, Cuba and China all came about as the result of an armed revolution, eliminating them as a model for a Socialist America. That leaves us with the Democratic Socialist nations of Western Europe, particularly the United Kingdom, France and Germany. However, these governments are too benign to fit the pattern being developed by Obama. Instead of looking east to Europe, we need to look south. To see how America will look in 2020 we need only to look at the nation of Venezuela and the Presidency of Hugo Chavez. The tactics, strategy, personality, goals and the rise to power of Obama resembles Chavez more than any other socialist leader in modern times. Obama’s socialism is fashioned after that of Saul Alinsky, an American socialist and founder of the Community Organizing movement. Alinsky is the author of “Rules for Radicals” from which Obama seems to get most of his tactical strategy. Although Dieterich theory, Marxist theory and the Alinsky theory differ in details, the overall philosophy and the results of that philosophy are enough alike that we can use Venezuela as the model for future socialism in America under Obama. Socialism does not have to be the future of America, but to avoid it we need to reset our political philosophy to a time in history when it worked. For most conservatives, that would be during the Administration of Ronald Reagan. I would go back even further, however, because by the time Reagan came on the scene we were so far along the road to socialism that his presidency was little more than a speed bump in its progress. The period I would use is the period between 1801 and 1825. I pick this time because the political challenge then was very similar to the one today. The question then, as now, concerned the size and power of the federal government. The Patriots who fought and sacrificed in the struggle against the British, quickly formed into factions after the Revolution. By 1787, there was a sharp division between the federalists who wanted a strong central government, and the anti-federalists who wanted strong state governments with a limited federal government restricted to those powers necessary for defense and other national interests. The Constitution and the Bill of Rights were the result of a compromise between the two. 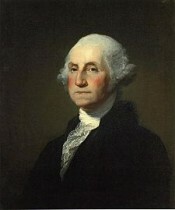 During the administration of George Washington, these two factions organized into the first political parties. Vice-President John Adams and Secretary of Treasury Alexander Hamilton organized the Federalist Party which led to Thomas Jefferson and James Madison establishing the Democratic-Republican Party, referred to generally as “republicans”, in opposition. The Federalist Party elected John Adams as President to succeed Washington in 1796. Since the Twelfth Amendment was not ratified until 1798 Jefferson, who ran against Adams and came in second, became Vice-President. As Vice-President and President of the Senate, Jefferson was able to keep Adams and the Federalists in check during Adams’ four year term. 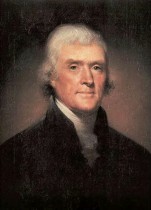 Years later Jefferson described his Vice-Presidency and the struggle with the Federalist in a petition to the Virginia Legislature on another matter. Jefferson ran against Adams in 1800 and defeated him. Jefferson was succeeded after two terms by James Madison who served also for eight years to be followed by another Democratic-Republican, James Monroe who served until 1825. By the middle of Monroe’s term in office, the Federalist Party had ceased to exist. The federalist’s philosophy did not reemerge until the progressive/socialist movement in the early twentieth century in the Administration of Theodore Roosevelt. Philosophically the Federalist Party was the forerunner of the Democratic Party of Today and the Democratic-Republican Party is the forerunner of today’s Republican Party. If we are to survive as a Constitutional Republic we have to find leaders who like Jefferson, Madison and Monroe are dedicated to defending and adhering to the Constitution and we have to start with the 2010 Congressional elections. Furthermore, we have to complete the job by 2012. If Obama wins a second term, socialism will probably be too firmly entrenched for reform to be feasible. Our first task is to retake the Republican Party and then retake the government and return it to its founding principles. To do that it is important we (1) actively oppose all socialist policies promoted by either party, (2) identify sound conservative leaders and, (3) support them in the Republican primaries and general elections of 2010 and 2012. This entry was posted in Commentary on Government Powers, constitution, Politics, Socialism and tagged Barack Obama, change, dieterich, hugo chavez, lenin, marx, obama, revolution, Socialism, statism. Bookmark the permalink.